Do you have an open concept kitchen design idea? At DeVrye our staff enjoy helping our customers think through the best options for their kitchens. 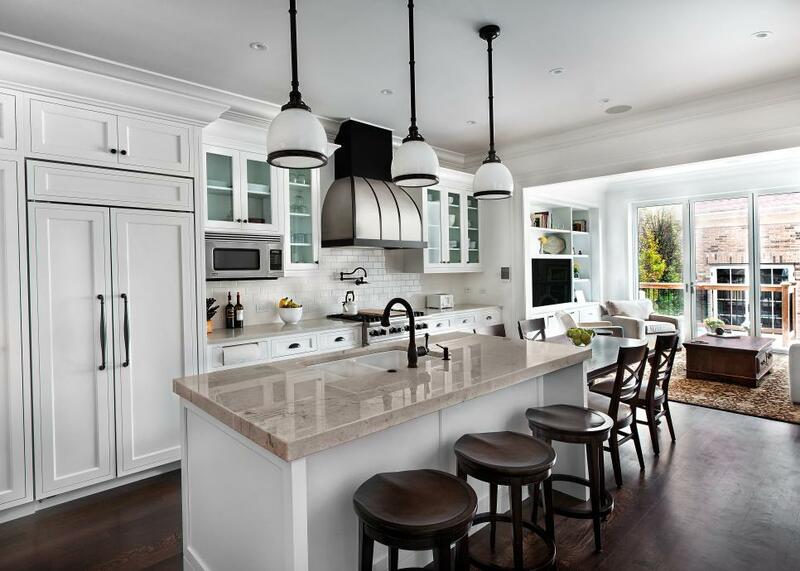 Listed below are 7 sensational open concept kitchen ideas that we have found on the internet. 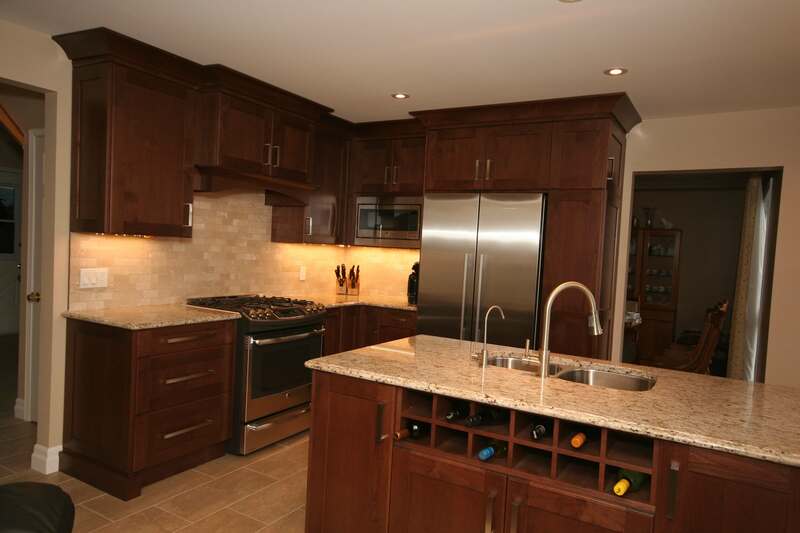 At DeVrye Renovations, we have installed countless open concept kitchens for homeowners in the Kitchener – Waterloo region since 1990. In fact, we have renovated more than 1,000 homes over the years. You can rest assured that, as members of the Better Business Bureau and the Kitchener – Waterloo Renovators Association we will provide you with nothing but the best craftsmanship and customer service. Do not hesitate to contact us if you would like to get started on your kitchen or any other type of renovation project. Here is a great idea for a corner kitchen. The image is included in the www.kdwhome.com gallery and demonstrates how a smaller, corner kitchen can be converted into a fantastic open concept kitchen. This kitchen features two sinks and gorgeous smoked glass cabinets. However, our favorite feature is the multicolored backsplash. The image below is from our own gallery that is a corner kitchen. If you are looking for something that is more than a simple cosmetic facelift and includes a complete overhaul and structural changes, contact us at DeVrye Renovations. 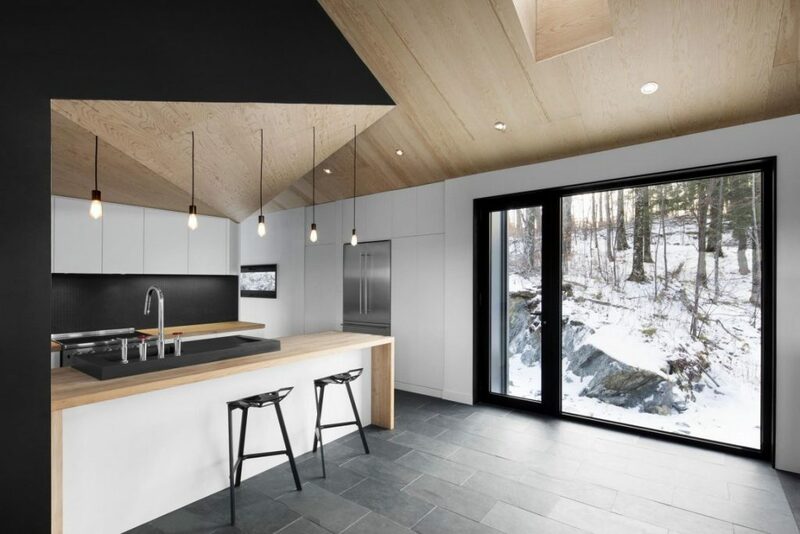 This layout shows how a modern open concept kitchen can flow effortlessly into a large living room. Imagine entertaining in this beauty! We found this image on Pinterest where it is reposted from www.zerodecor.com. If you are planning to open up your kitchen space and currently have a galley style kitchen backing onto a living space, this option might work for you. Our favorite feature is the enormous marble counter that provides a huge amount of preparation space, coupled with an eating area. Take a look at our gallery for kitchen renovation ideas that might appeal to you. For a truly clean and contemporary looking kitchen consider creating your own version of this offering from www.homedit.com. Perhaps more suited to a smaller kitchen area, this European style with an angled roof has a truly unique appeal. Our favorite feature is the simple color scheme which provides a clean, unadorned backdrop for everyday kitchen life. 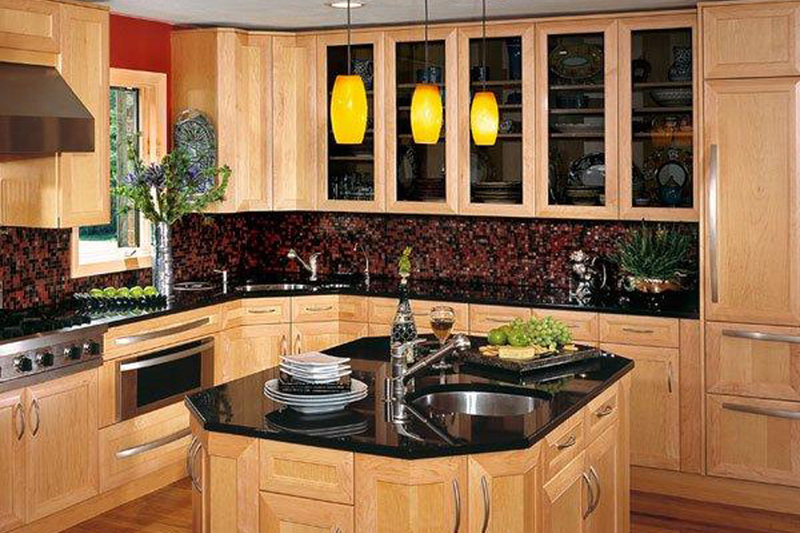 Talk to our knowledgeable staff and get the ball rolling on your kitchen project. There is something about white in the kitchen that is just right! If you appreciate all-white decor, then this kitchen will surely appeal to you. From the experts at www.hgtv.com, this room would work well where a long kitchen can lead directly on to a sunny living area. With an ageless traditional style, this open kitchen is easy to work in and provides a great connection with the living area without crowding into it. Our favorite feature is the pendant lighting over the island. At DeVrye, we are more than capable of creating a functional kitchen that combines style with practicality. Contact us now and share your kitchen ideas with us. Take your dull, boring, dated kitchen and convert it into a functional and fun kitchen that will stun your family and friends. 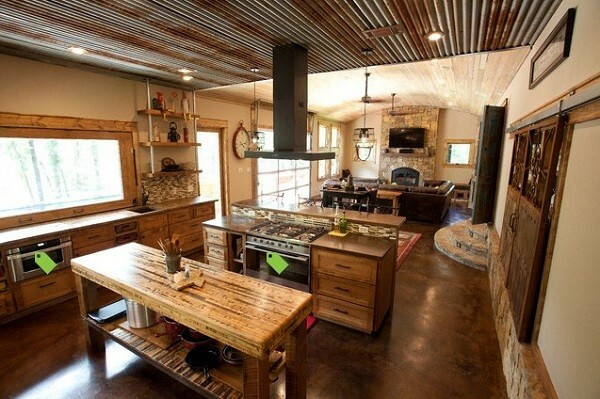 For a rustic look that might just have time-warped out of an old western movie, this renovation from www.houzz.com is special. If you don’t like wood and you don’t like brown then look elsewhere as this open concept kitchen and living area has lots of both! However, our favourite feature is just that – rustic wood! Are you frustrated with the size of your kitchen? Are you and your family tripping over each other in a small, cramped space? Do you feel isolated from your guests when preparing a meal? Eliminate all these negatives by installing an open concept kitchen in your home. Contact us to find out what the experts at DeVrye can do to improve your kitchen and living area. We can also assist you in finding financing to meet your needs. 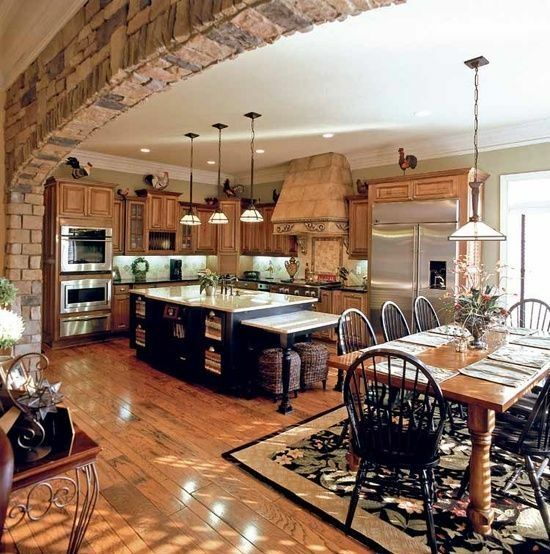 Why not use a brick arch to frame your open concept kitchen? That’s what these homeowners have done with this warm and inviting kitchen we found on Pinterest, pinned from www.indulgy.com. The large island provides plenty of storage along with a large preparation area. Finished in stark black, it contrasts splendidly with the predominantly brown room, making it a strong focal point. Note also how black is cleverly and subtly tied in with the dining room chairs and carpet. 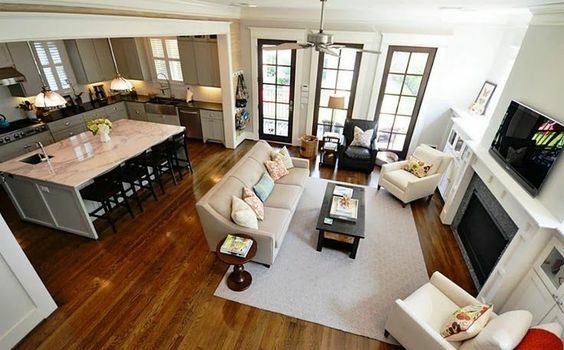 Our favorite feature is the rich brown flooring which gives a strong foundation to the entire space. If you are interested in our work, take a look at our gallery for kitchen renovation ideas that might appeal to you. An arch may or may not be feasible in your home. If any of our ideas has provided you with inspiration, we would be delighted to hear from you. 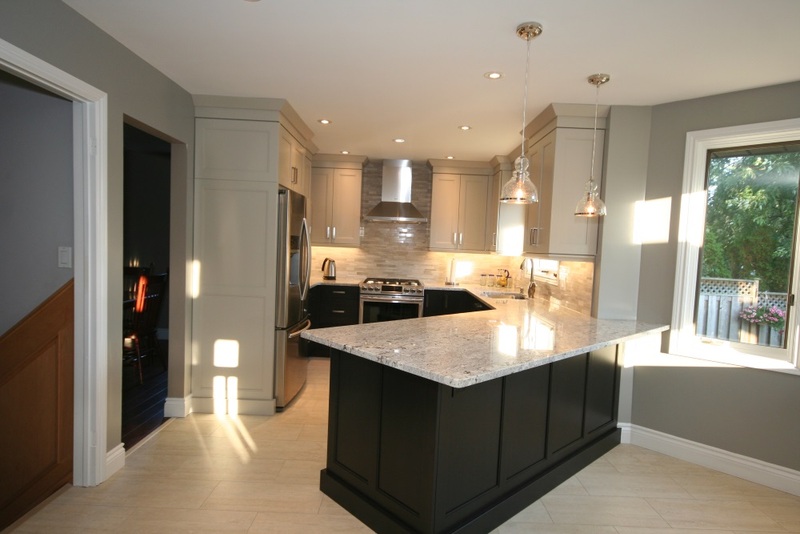 Our team of professional renovation experts can help you design an open concept kitchen that will provide you with satisfaction for years to come. 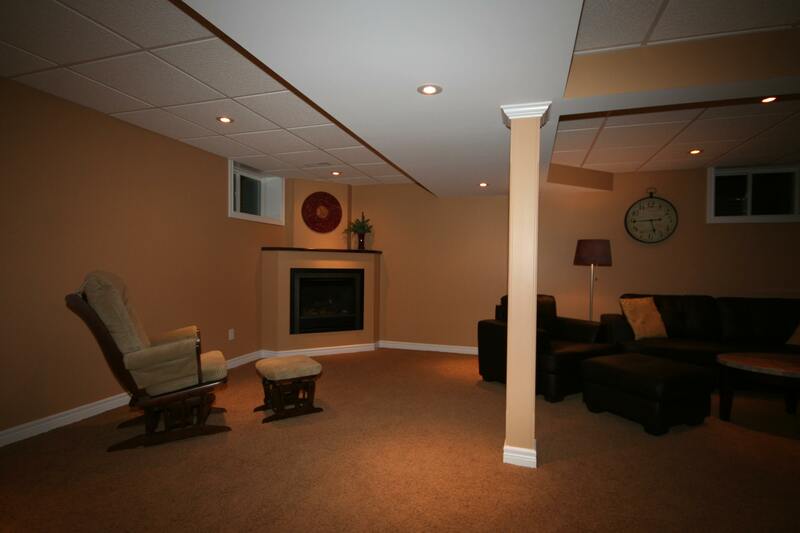 At DeVrye Renovations, we are committed to providing Kitchener-Waterloo, Cambridge, and Guelph area residents with nothing but the best. 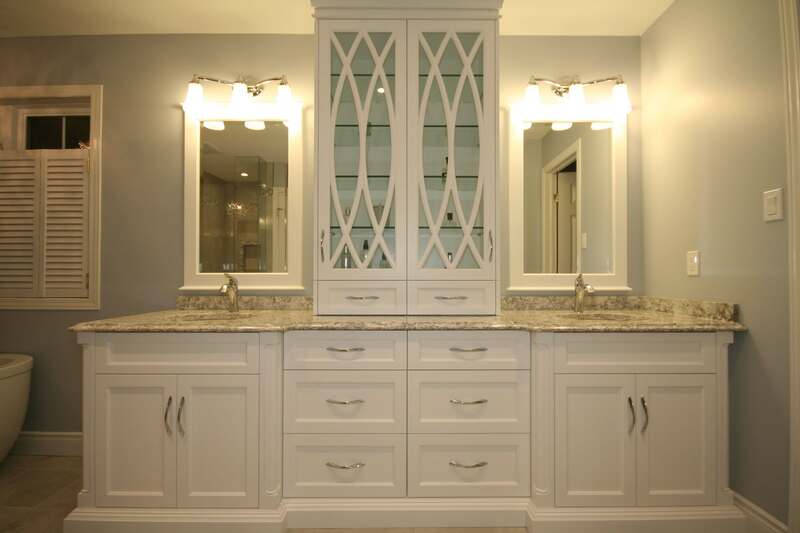 Talk to one of our team of professional craftsmen to determine what type of kitchen renovation will provide your family with a more functional and enjoyable living space. We guarantee that we will work hard so that your experience remains excellent during every aspect of your kitchen renovation. If you have any questions about renovations or about our services, do not hesitate to contact us!